William H. “Bill” Bartlett, 85, of Waterloo, Iowa, died Monday, December 29, 2014, at the Cedar Valley Hospice Home. He was born June 11, 1929 in Waterloo, son of Harold and Dorothy Weldon Bartlett. He married Marjorie A. Evans Feb. 1, 1953 in Waterloo. He graduated from East High School and served in the U.S. Navy from 1948 to 1952 as an airplane mechanic aboard the USS Midway. Bill worked at Rath Packing Co. for forty years until they closed and then Allen Memorial Hospital in maintenance, retiring in 1994. He is survived by his wife; three sons: Bob (Robin) of Brooklyn Park, Minnesota, Jim (Carrie) of Maricopa, Arizona, and Bill (Angie) of Cedar Falls; two daughters, Deb (Will) Opperman of Washburn and Sherry (Jerry) Clausen of Waterloo; 11 grandchildren; 14 great grandchildren; two brothers, Jerry (Shirley) of Waterloo and Curt (Liz) of Hudson; a sister Karen (Gary) Gillette of Waterloo. Preceded in death by three siblings in infancy, Donna, JoAnn and Robert. 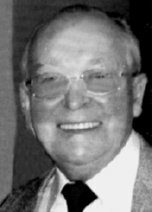 Services: 10:00 a.m. Monday, Jan 5, at Hagarty-Waychoff-Grarup Funeral Service on West Ridgeway with burial in Waterloo Memorial Park Cemetery. Full military rites will be conducted by the Cedar Falls Amvets, Post 49, with flag presentation by the U.S. Navy Honor Guard. Public visitation will be from 4 until 7 p.m. Sunday, Jan. 4, at the funeral home on West Ridgeway, continuing for one hour before services.